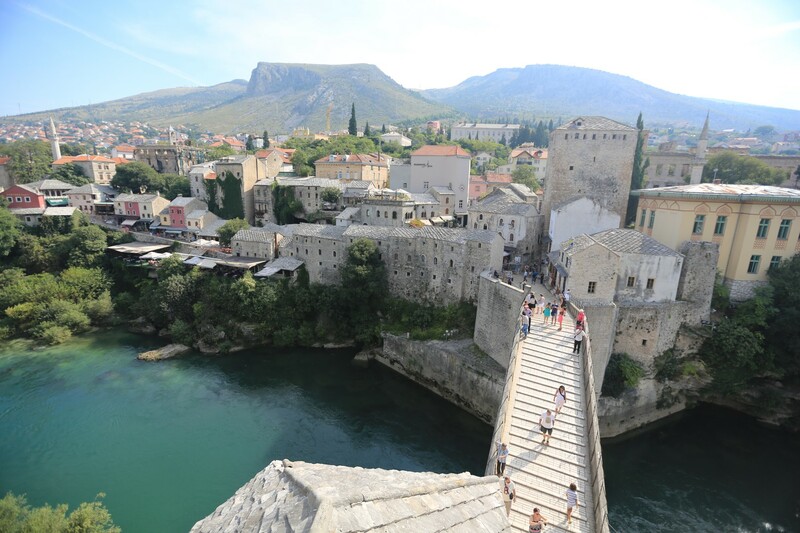 Mostar, Bosnia. There was a war here. Recently. I cried (actual tears). I came to Bosnia. I had been in the gorgeous country of Slovenia which I hope to blog about later but I ran into an American couple who were traveling around the world. They told me “if you have a rental car (I did) ou should drive to Bosnia. It’s just a few hours away and it’s very different.” They forgot to remind me that the country was nearly destroyed by a war that ended in the late 90’s – less than 20 years ago. But more on that shortly. This is where I was today – picture is less than 20 years old. Let me tell you quickly – Slovenia is the most perfect country I have ever been to – there’s no trash, the architecture looks like it’s out of a storybook, everything is green, the people are amazingly nice. It’s like a commercial for perfect land. Slovenia isn’t actually connected with Bosnia but it almost is – Croatia is in between. Speeding on perfect freeways first in Slovenia and then in Croatia all I can think is – “Damn, when did these people all build these absolutely amazing roads”. Another world. Just another world. I’ve come to appreciate how real borders are. They are theoretically arbitrary lines in the Earth but just like going across from San Diego to Tijuana is like traversing to a different planet so was this. Bosnia is a mess. The roads aren’t Madagascar bad but they are light years from what I had been on. I had inadvertently left Disney Land and I can’t say I was 100% ready for that – I was sort of enjoying Disney after the mess in Turkey – but of course I wasn’t going to turn back. Google maps isn’t really functional in Bosnia – the route it took me on was absolutely wrong and absolutely a nightmare. Note to reader – if you go to Bosnia – “Just Say No” to Google maps at current. 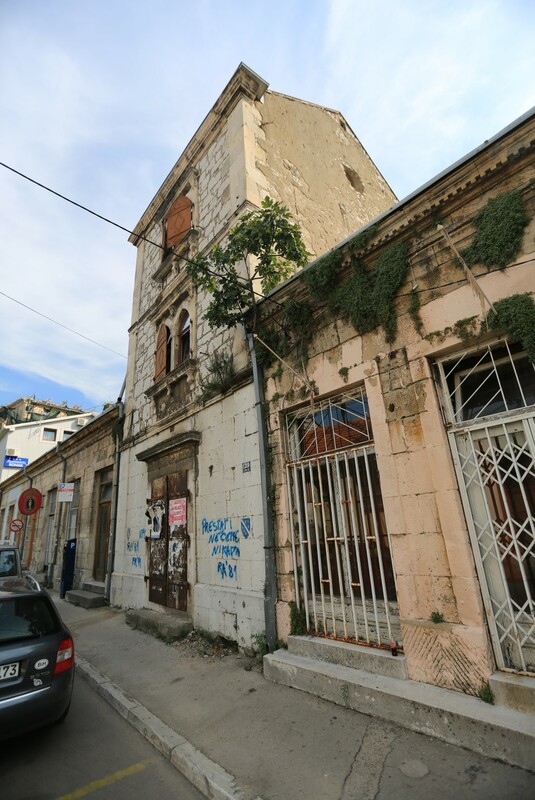 By the time I finally got to Mostar in the dark of night I felt like I had made a big freaking mistake. The 6 hours had been turned into close to 10 hours and I was wiped out but I needed some food and this old city of Mostar turned out to be pretty storybook looking by night. Found a really great restaurant even though it was in the “Tourist Strip” it was really delicious and cheap. Back to an AMAZING bed in a big room that cost me …. $15. Mind changes. Bosnia = good. Wake up refreshed and start to walk into town. Start to notice. Start to remember a blog post. These buildings are messed up. They aren’t “TJ” messed up as in badly built. They are old structures and they have pock marks all over them – like a giant woodpecker got at the stone. There are parts that are crumbling – but not in a natural fashion – looks more like a bomb went off …..
Sorta like a bomb went off …..
Not bad construction – just shot full of holes. In 1993. Back to that gorgeous old bridge. I walk across it and I see a sign “War photos exhibit”. I climb into the tower where the exhibit is. 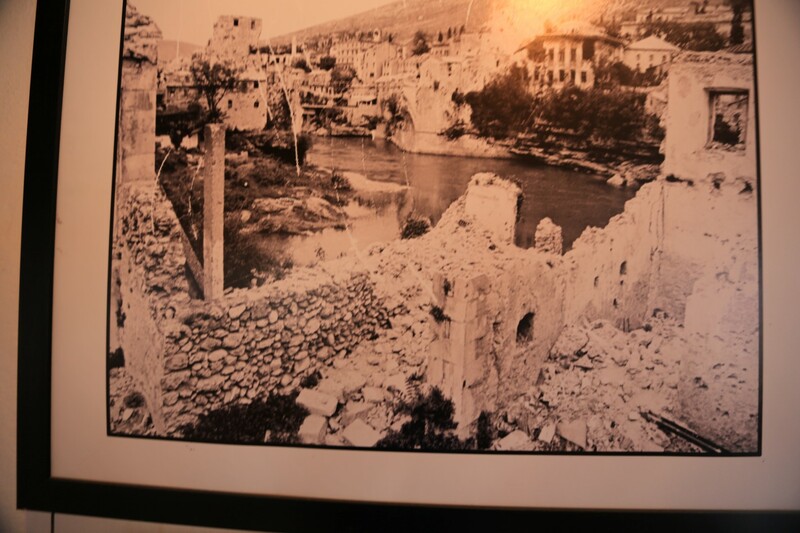 A beautiful local girl who looks about 25 tells me that there are 50 photos taken by a New Zealander who was in Mostar during the war. Every one of the photos is from roughly this 10 block area. 2 Euros to enter. I pay. I walk up into this old building and I see the streets that I have been walking on – except they are freshly blown up. I see kids who aren’t some old relic from WWII – I see kids in these pics and I think to myself “Is that girl at entrance one of these kids?” (She isn’t BTW – but she could have been – more later). 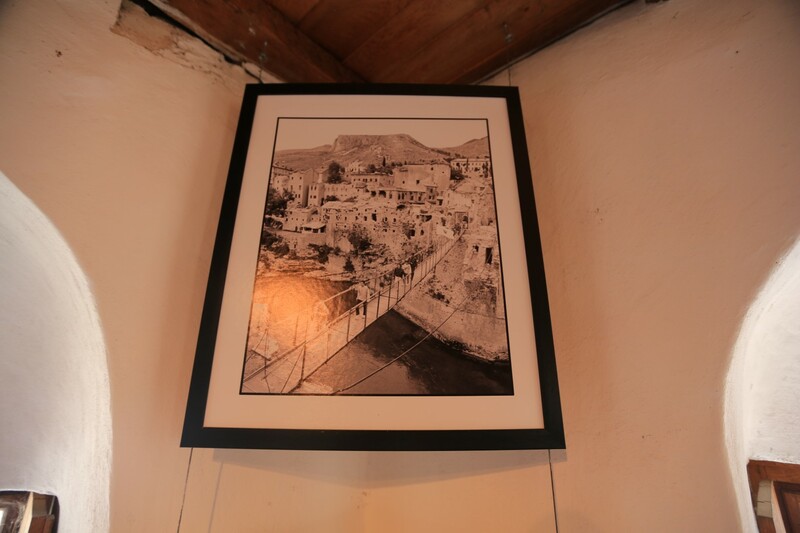 Then I see the gorgeous bridge and the gorgeous buildings around – or – should I say I see the gap where the bridge was bombed out and I see the buildings that I am looking at through the windows of the exhibit – but in the picture they are half blow to bits. I started to cry. I was alone in the exhibit and I couldn’t stop crying. I was gushing tears. I was thankful no one else came in. It was just so mind blowing that this place that is now a tourist town with lovely architecture, great food and dozens of souvenir shops – that 19 years ago it was being bombed and bombed hard. 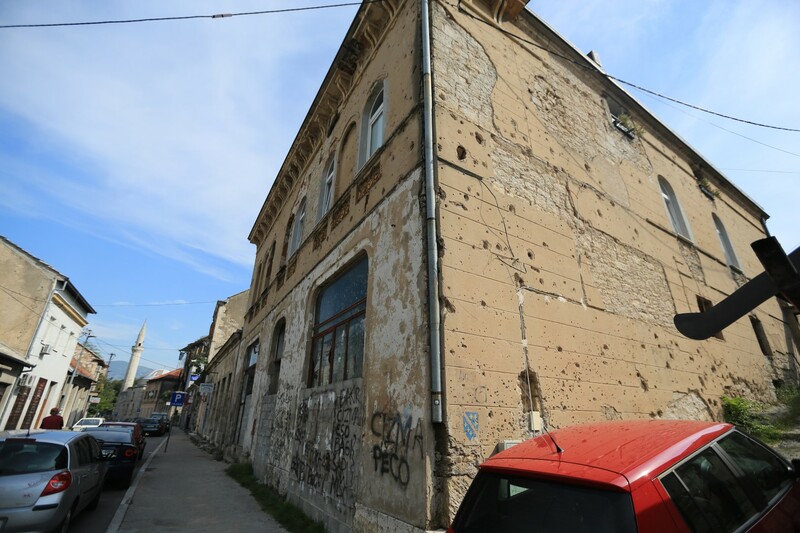 That the holes in the buildings where I was walking around had been shot up and just simply haven’t been fixed yet. Anyhow, yes, she was aged 3-5. The safe space for her family during bombings and firefights was in the “well” below a mechanic garage (a place to fix a parked car sitting on top). Her memories of the war were mainly her time spent there. Hours on end and insanely boring. Sitting quietly, making rings and toys out of pieces of metal that she and her sisters would find in the space. Those were the only toys that she had. If you know me you know I can talk an ear off twice and especially with a subject like this. It was like talking to someone from a set of a WWII movie – or reading accounts of WWII survivors …. but she’s just a young lady – who was wearing jeans and a blouse. She wasn’t in black and white, she wasn’t an exhibit, she wasn’t a mannican. I chatted with her for about 20 minutes. I wanted to squeeze her and apologize for humans being so whacko – but really she didn’t need it. The weak one at the table was me. At least I didn’t cry on her – that would have been completely unacceptable – LOL. 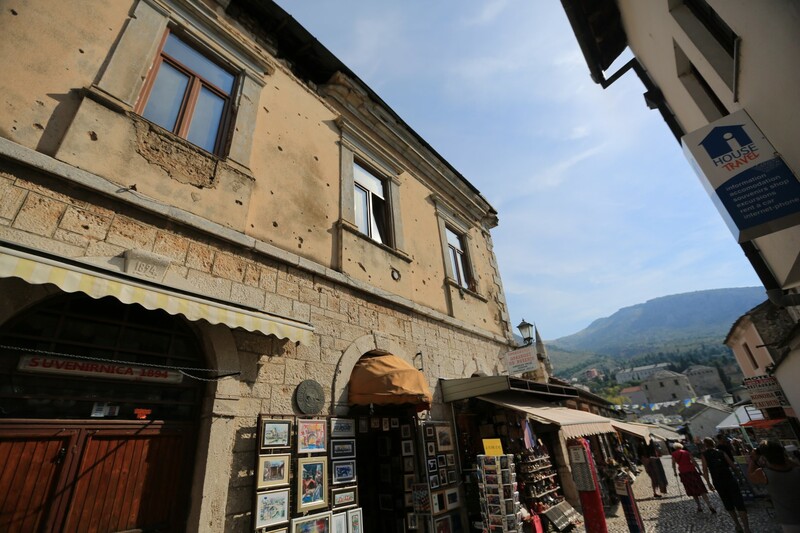 So Bosnia – now a tourist mecca because it’s cheaper than a lot of places and has a lot to offer. Hopefully people will take a moment to dig in to what happened here in their own lifetimes if they get the chance to make it. I was severely moved and am grateful to have met the couple that directed me here. I’m more grateful to have walked into that tower. And so the Curious Adventure Continues. I am enjoying your blog so much. Will there be a book to follow when you finishyour trip? As a Bosnian, I thank you for this beautiful piece about my country. Thanks so much for reading. 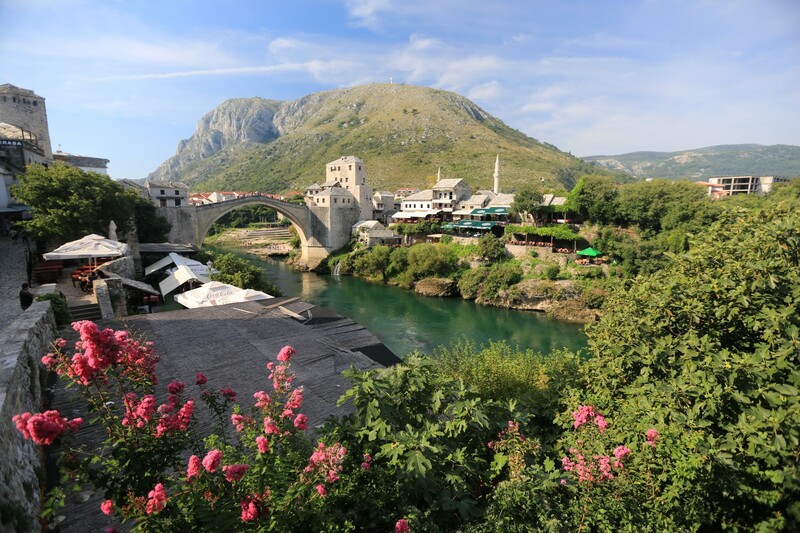 I spent a few more days in Bosnia after this and it was such a beautiful country. 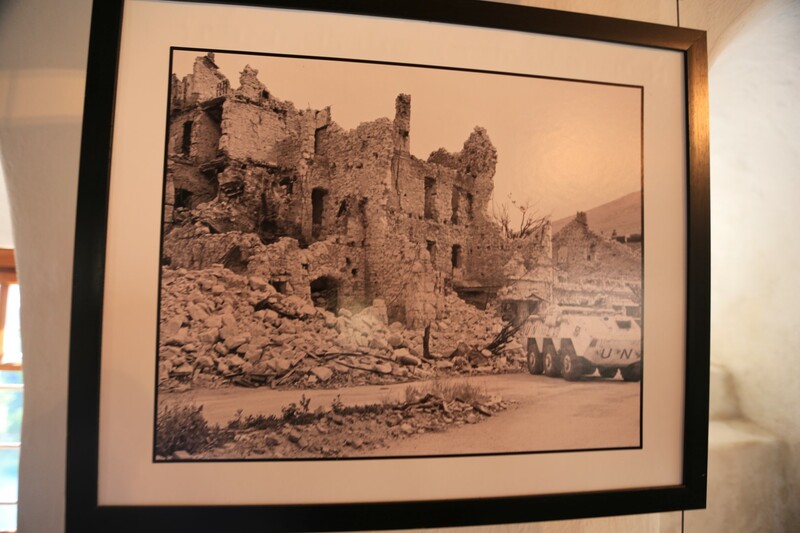 I also visited the war photos museum in Sarajevo and it was more gripping than that in Mostar. I met really wonderful people while I was there who were so helpful in various ways. It means a lot to me that you enjoyed the journal. ← How I turned the amazing city of Istanbul into the most dangerous place I’ve been yet.